In a very recent post I highlighted the need to tear down the walls within marketing, PR, media and advertising. Having highlighted the problems that come from trying to keep segregated, functions that should be totally integrated, I now want to propose a fairly obvious solution. 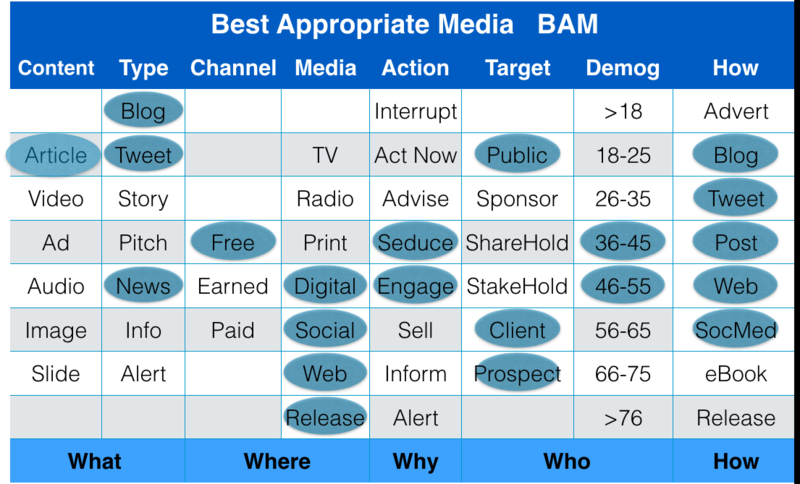 BAM – Best Appropriate/Available Media ! It’s about taking a more holistic approach to Marketing Communications by focusing on messages and outcomes rather than tools. Rather than doing a Press Release or posting in Social Media or even running a TV Commercial take a step back first to do some objective planning. Recently when I read of the twenty fifth anniversary of the tearing down of the Berlin Wall I was reminded of one of the great speeches in history. In June of 1987 US President Ronald Regan stood at the Brandenburg Gate in Berlin and called on Russian President, Michael Gorbachev, to tear down the wall that had divided the city for 26 years ….. and just over 2 years later it was gone. At the time I was midst some work for a couple of clients that had me dealing with the imaginary walls that still seem to divide PR, Marketing, Sales, Advertising, Social Media etc etc. in the mind of many. For one we were doing PR and the other we were doing Social Media . In April of 2008 I read an enlightening book by David Meerman Scott which set out to define the Rules of Marketing and Social Media in the Internet Age. This week I had a meeting with a colleague, Mark Aiston, who is about to launch an incredible on-line media training service . We were talking about how to utilise Social Media Marketing to reach his target market and in particular LinkedIn. Having responded briefly with an outline of who we were the prospective client was able to check us on LinkedIn and in particular read some very relevant recommendations about our service. Recommendations such as these prove the value of asking clients and colleagues to add a recommendation to your profile. The prospect was based in the UK but had no hesitation in Linking to me and talking about the brief. This subsequently lead to a meeting whilst she was in Australia and them becoming a client. So LinkedIn allowed me to connect with a prospect halfway round the world and them gave them all the info they needed to assess us and as a result arrange a meeting that would not have been likely otherwise. So I can certainly say that having an up to date Profile, some good recommendations and checking the Q&A section regularly has paid off. It has also proven that these days in our industry your clients can be located anywhere … and its great getting paid in Pounds Sterling given the current exchange rate with the Aussie Dollar. They want me…. on the Mckinsey Online Executive Panel? We invite you to join McKinsey’s Online Executive Panel, through which The McKinsey Quarterly asks selected executives their views on top business trends, including the economic crisis, and on topics relevant to their functional area of expertise. When I received this invite I was indeed surprised and flattered… But as I read on I worked out what they wanted was just another member for their community. Maybe I am not special after all. Seth Godin calls them Tribes but everyone wants a community to help, promote, support their brand. A community mediated by technology and aiming to produce some productive outcomes. Then I read an article by Menaka Gopinath who provided a further insight into what McKinsey wanted of me – they wanted to engage me in in their business decisions by participating in polls etc. They want me to feel important to say the least. Then Jeremiah Owyang in his Web Strategist blog challenged me to look at all this from another angle Future of PR – Agencies Represent Communities – Not Brands. I wonder what Eric will think of this when I seek his opinion. I learned from Menaka about how companies like Mercedes Benz (better tell Eric the Europeans are onto Social Networks for business) seeking to engage the consumer voice via exclusive member only communities. They want to engage you in the brand even more than Twitter, Facebook, Blogs etc can . They want you right on the inside. But as Jeremiah asks are we moving towards a complete reversal where Communities represented by PR Agencies actually drive and develop new products even new brands. A fascinating evolution. Love to hear what you think? Should I join the McKinsey Panel? I am off now to read the 50 plus opions posted on Jeremiah’s blog to see what his community thinks about all this, before I have a coffee with Eric.